Our before and after school studio for students aged 8-12, Studio 7 offers a wide range of activities designed to encourage independence and imaginations. This is where the idea of shared control truly comes to fruition, as the older students are able to participate in creating their own program. Students contribute to classroom design, and agreements, activities and extra-curricular activities like fundraisers. 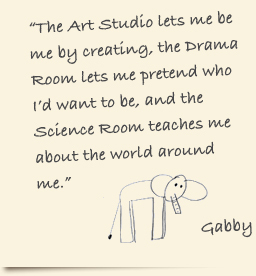 Students can choose to engage themselves in Art, Woodworking, Science Lab, games, Build Zones, or Drama/Performance on our stage. Electronics include computer and an Xbox 360, with appropriate games for the students. The Quiet Area and Homework Zone are always available for students who wish to read and rest. Aiming to provide a location filled with excitement and exploration, the children are encouraged to unwind and participate in available activities.